Very rarely, a hotel captures the feeling of coming home, only better. It’s definitely a place I don’t mind waking up to (even at 5am). If I could sum up all of my home (and hotel!) dream points into one super wishlist, Hotel Carlota would check every single one. 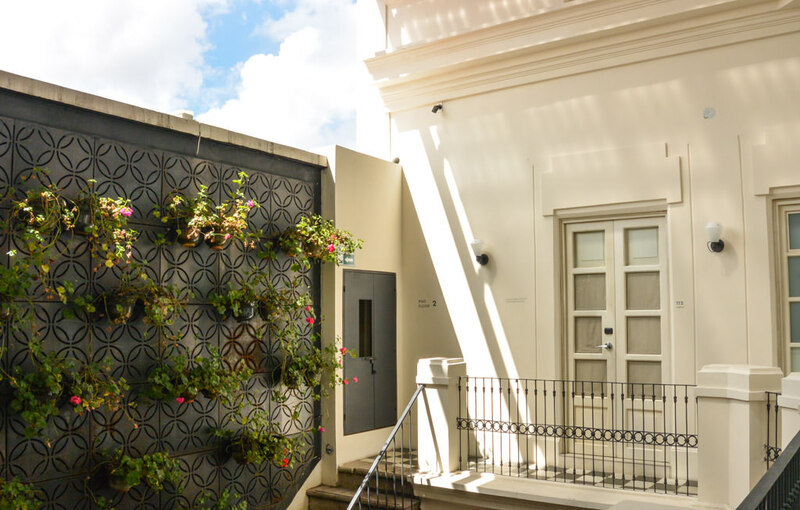 The perfectly located, sustainably-focused, beautifully decorated hotel is housed in a century-old home that oozes warmth and timelessness while at the same time being modern and on-trend. The stay might have left me speechless, but has instead left me absolutely raving about the place. Seriously, I have not been able to shut up about Hotel Carlota to friends and fellow travel lovers. From all of the hundreds (maybe thousands?) of both big and little “YES!” moments throughout my stay, I’ll make it easier on you, dear reader, by summarizing my favorite aspects of Hotel Carlota in the four main categories I use to judge hotel stays: Bang for the Buck, Welcoming Boutique Style, Walkability, and Personality. 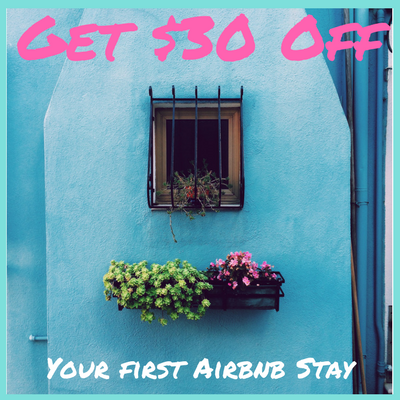 Hotel Carlota’s nightly room rates start at just under $200. 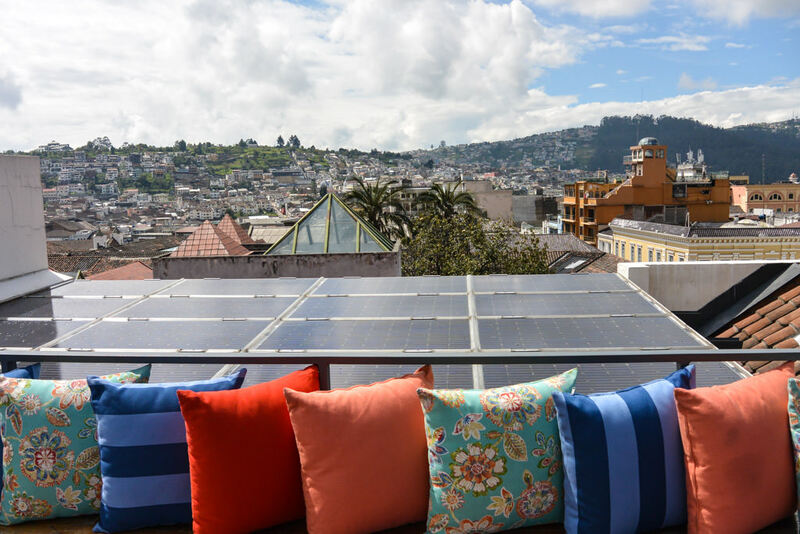 This is definitely not the cheapest hotel in Quito, for good reason. 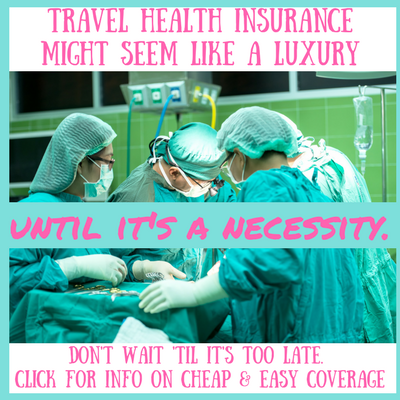 The price tag is easily a justifiable splurge, even on a budget and especially for a special occasion. The rate includes a full breakfast, one-way transfer, and turn-down service, in addition to outstanding wifi throughout the hotel. 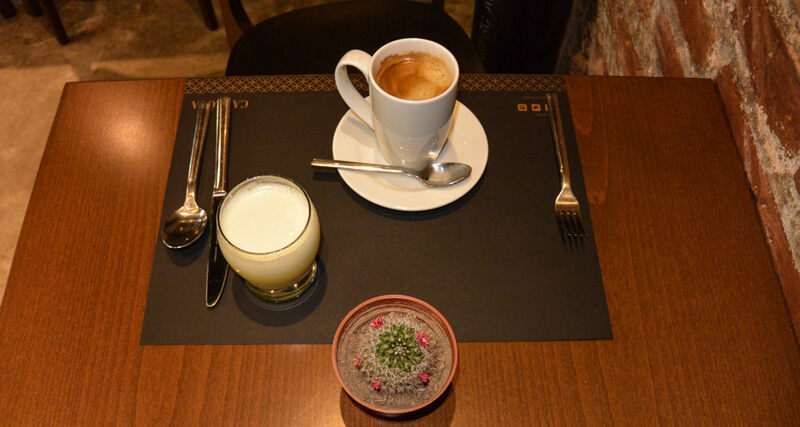 The breakfast includes several plates, including fresh seasonal fruit, homemade bread and jam, and made-to-order eggs with cheese (and meat, if that’s your thing), along with a delicious coffee or tea and fresh-pressed juice. 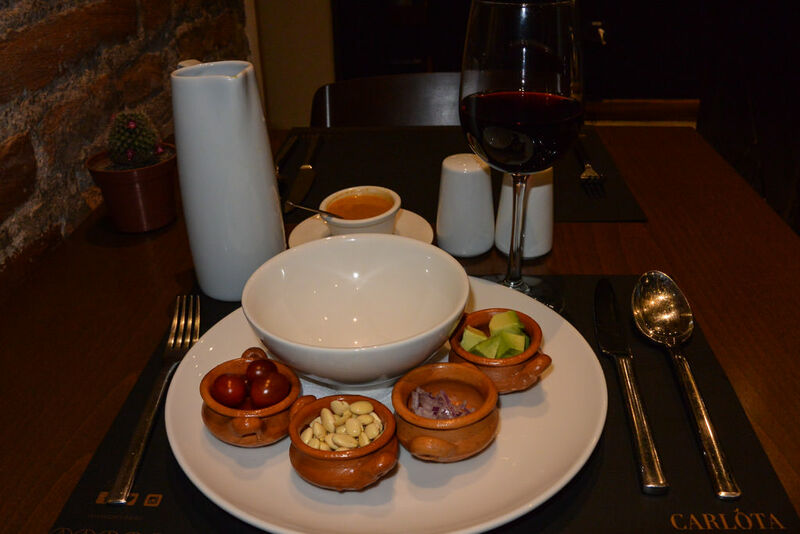 It was a simple yet delicious and refined way to start my days in Quito. 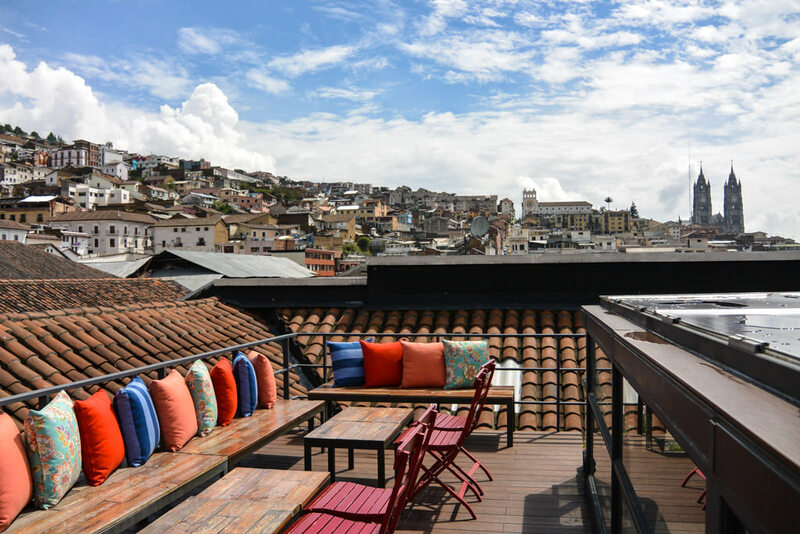 It’s worth it to note that your stay in Hotel Carlota also includes access to invaluable advice from the front desk attendants (and a map or two), helping you to sort out the best activities that Quito has to offer. 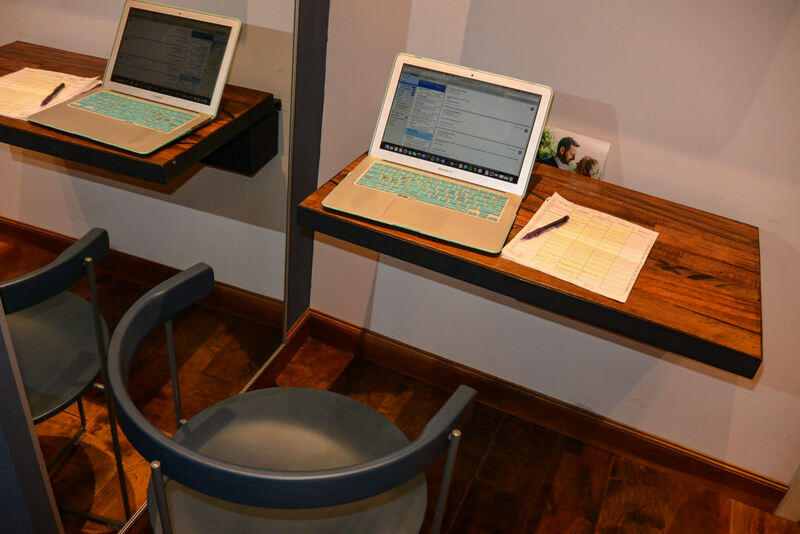 In addition, Hotel Carlota is equipped with some of the best common areas that I have ever experienced in a hotel, all different and stunning without being stuffy or unwelcoming. You absolutely cannot pass up the rooftop sitting area! 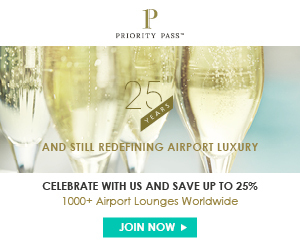 I would expand the definition, personally, to include a high level of personalized service and unique amenities. 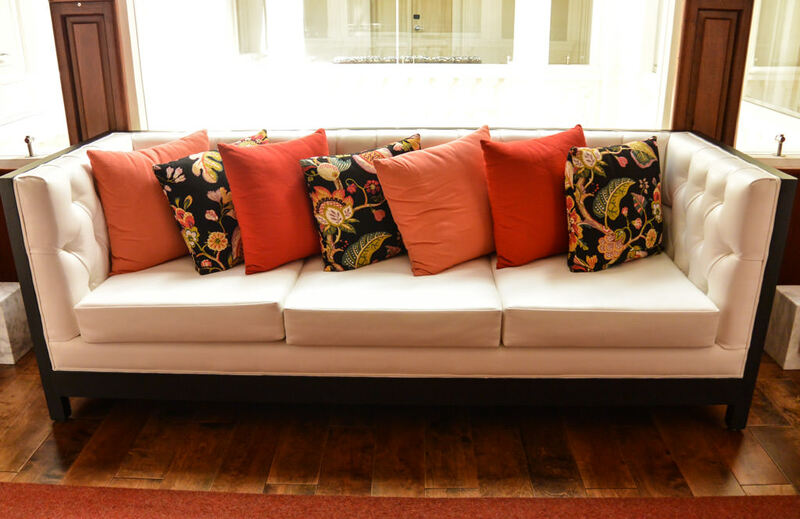 For me, a boutique hotel must be chic and trendy, while also feeling welcoming and comfortable. Hotel Carlota fits this definition to a T, and then some. The entire hotel is furnished with welcoming touches, from magazines in each room and books in the sitting areas, to thoughtful services like extra blankets provided at the turn-down service on cold nights. 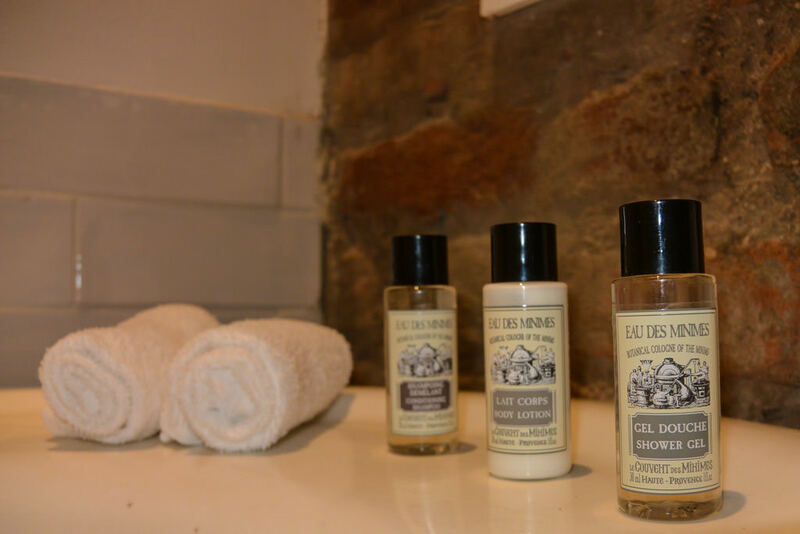 The comfortable robes and slippers take away any chill in the air (or the pretty tile floors), and the fancy toiletries make you feel like you’re being extra pampered. Even the basics of the hotel (the mattress, the pillows) are extremely comfortable and of the highest quality. I was SO excited to see not two but four pillows gracing my room — the Galindriona — when I checked in. The hotel also has some serious history, adding to the boutique and chic feel. It is located in a renovated family home that dates back to 1905. The bones of the structure have been kept, as have many details (oh, those stunning courtyards! ), but modernized and brought up to date. 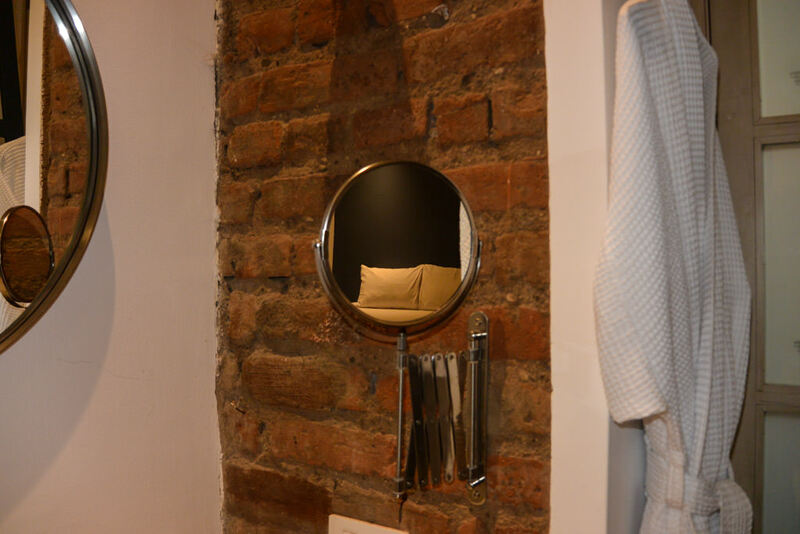 While the rooms might be slightly small (as is normal in boutique hotels), and lacking in external windows due to the original style of construction, they definitely do not feel claustrophobic. High ceilings and expansive details, along with expertly crafted floor plans and convenient details, provide feelings of space to spare, and the common areas are even more wide-open. 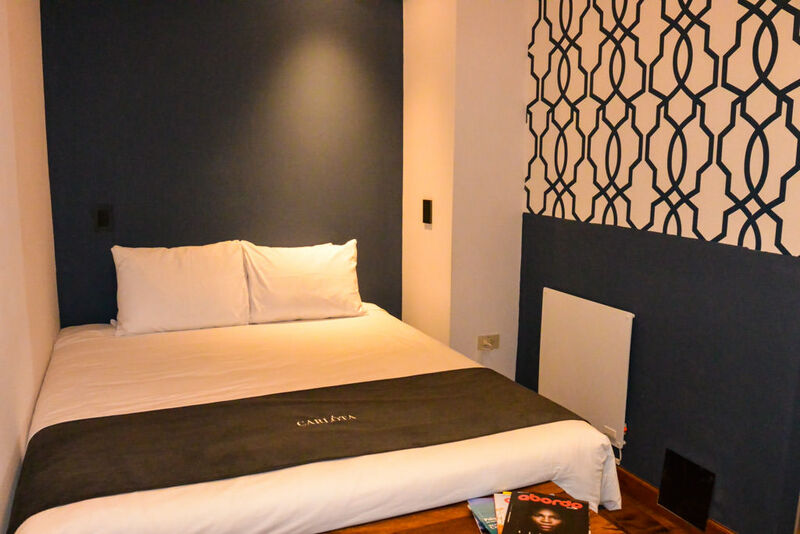 Hotel Carlota has perfect the welcoming boutique atmosphere. Every moment feels special, and every object and furnishing feels thoughtfully chosen. 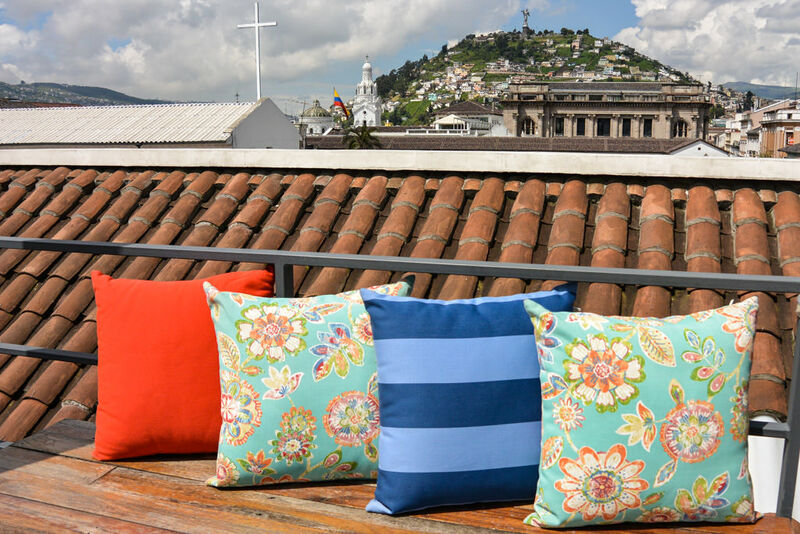 In the heart of the historic center of Quito, Hotel Carlota provides unbeatable walkability and is perfectly located. There are so many sights just a short stroll away, including the center square shown above. Some of the city’s fanciest restaurants, and most authentic back-alley eateries, are within a block or two. To be honest one of the best meals of my life was at the hotel’s signature restaurant — so you really don’t even have to leave! 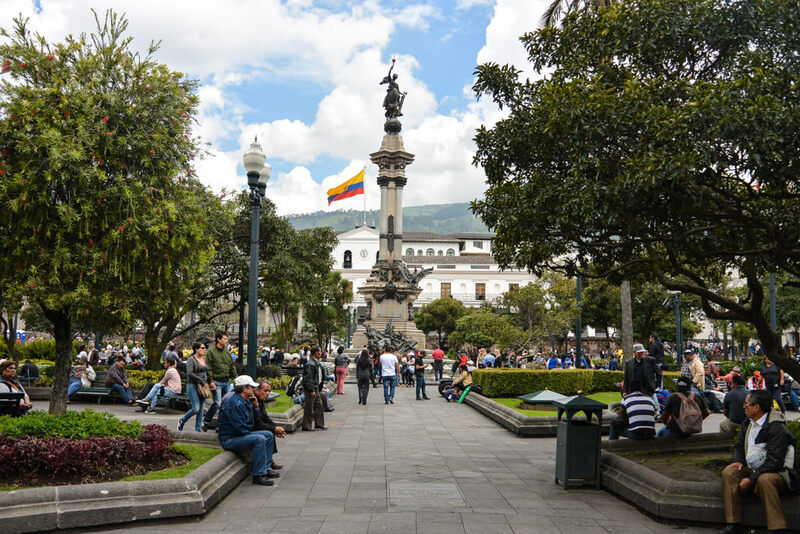 Because so many of Quito’s main attractions are located just a few minutes’ walk out the door, you really wouldn’t even need to catch a cab throughout your stay, except for maybe your ride in and out. The traffic in and out of the historic center can be awful, so this is definitely a plus! 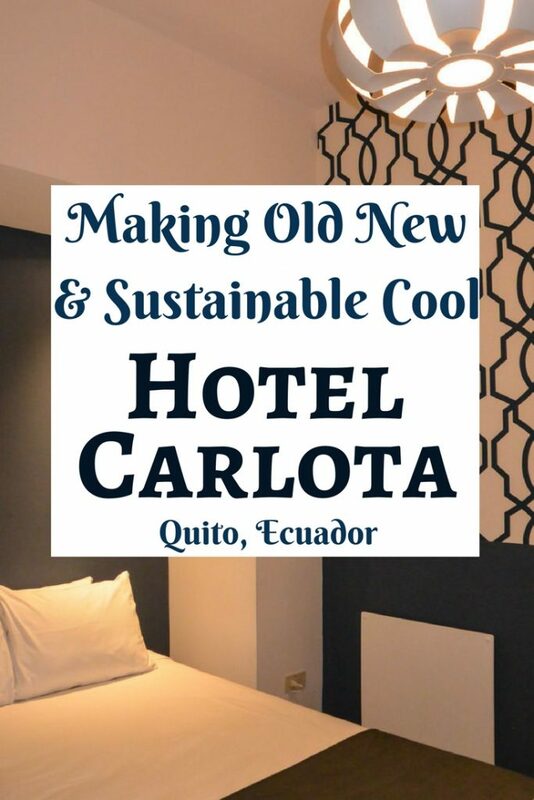 My favorite characteristic of Hotel Carlota is a major aspect of its personality and style: its sustainability. 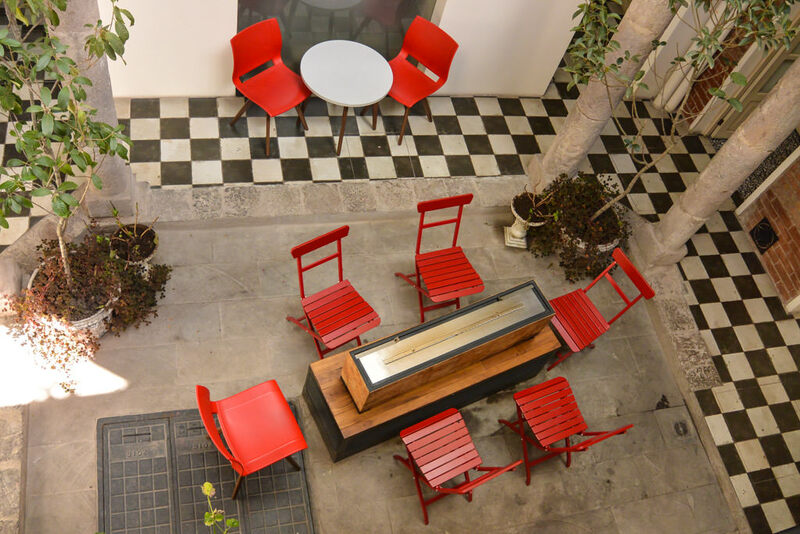 The proprietors of Hotel Carlota have created a lovely mix of old and new pieces, both sustainable in their own way. The older pieces are originals, refurbished to fit into the new hotel’s look, while the new pieces are made from recycled materials! 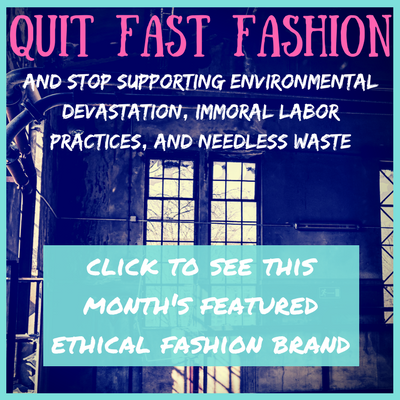 Sustainability doesn’t stop there. 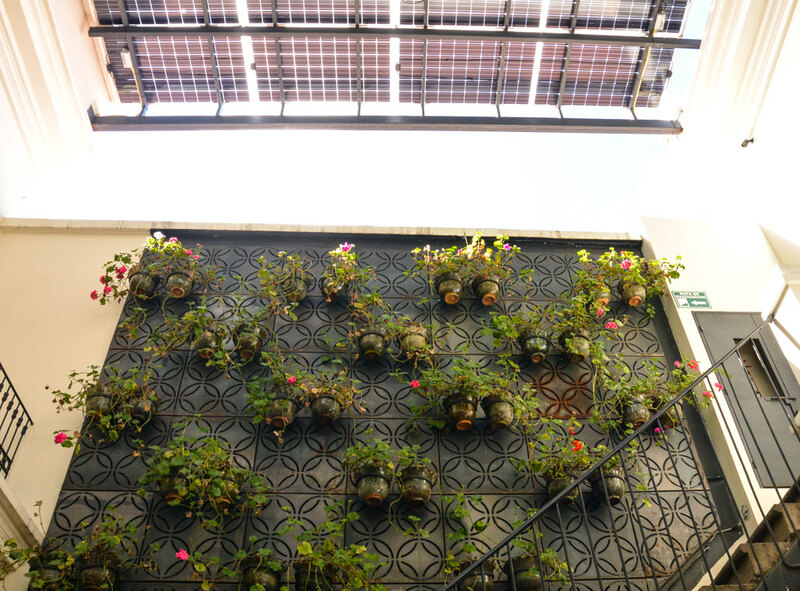 30% of the hotel’s electricity is self-generated, coming from solar panels positioned unobtrusively on the roof. The hotel also recycles its own water. The hotel is one of the first (if not the very first) LEED certified hotels located in an older building. Most LEED certifications are granted to new, purpose-built buildings. It’s a real accomplishment to preserve a historic building while making it sustainable for the benefit of future generations. 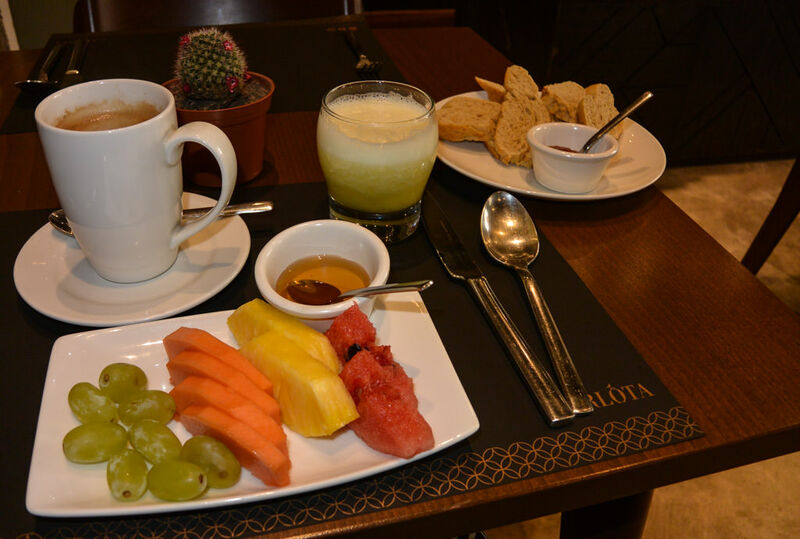 I visited Hotel Carlota’s restaurant several times for breakfast, and once for dinner. Before the dinner, the chef came out to my table to talk to me about my vegetarian dietary restrictions. He made suggestions and asked about my preferences, which I found really really nice. While I’ve been seeing more and more restaurants with at least one vegetarian option, most seem to just slap on an option or two without thought to taste or style. When someone becomes vegetarian, they stop eating meat, they don’t lose their tastebuds. Aside from the chef’s personal recommendation for a three-course menu (with which I let him run wild), there were MANY vegetarian options on the menu, including “regular” dishes being converted to vegetarian. 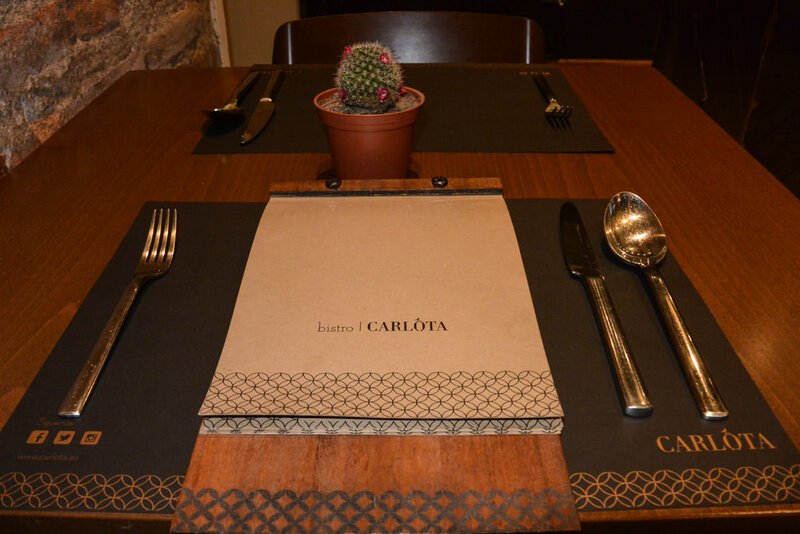 Hotel Carlota is a great choice for non-vegetarians as well (of course, with even more menu options). The restaurant sources its ingredients locally (most from a nearby market), and chooses seasonal products. It is a beautiful restaurant, down to each tiny detail. The exposed brick, the little cactus on the table, and the perfectly folded napkins lend to an atmosphere of indulgence and warmth. When the food comes, it is both beautiful and very appetizing. 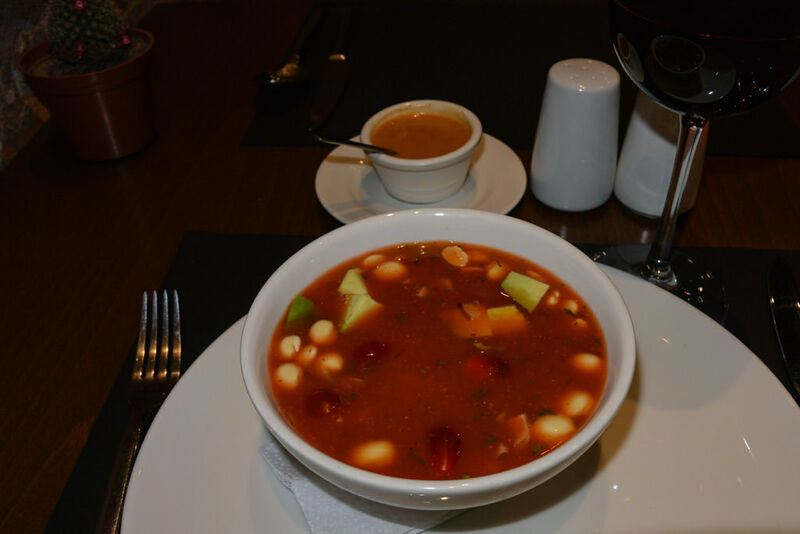 I loved the presentation of my cevi-chocho (a traditional cold soup with lupine, onion, and avocado), and how I was able to add the ingredients myself and pour the liquid over top. 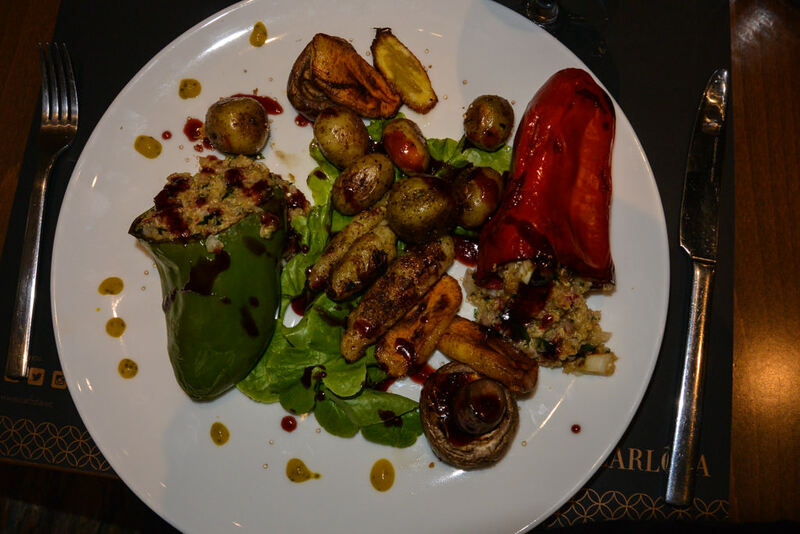 My main dish consisted of stuffed peppers, surrounded by the most perfectly cooked mushrooms and variations of potato that I have ever tasted. Usually, dessert isn’t really my thing. 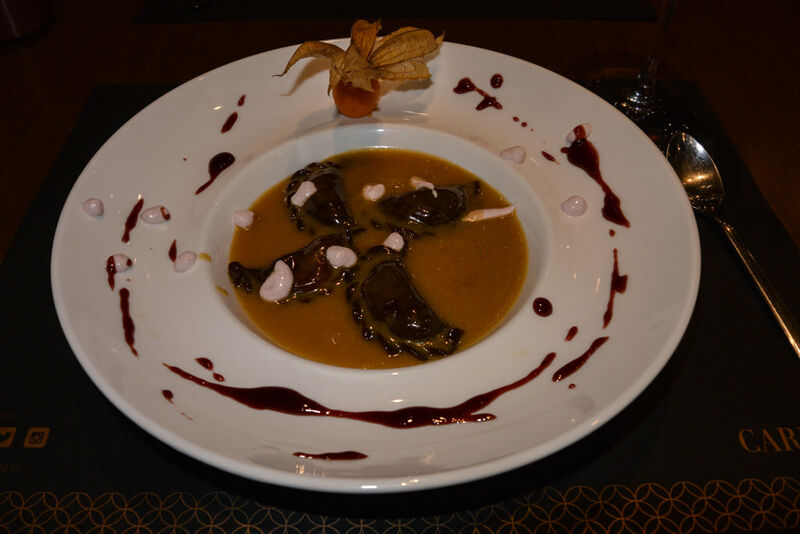 At Hotel Carlota, this “toffee of coffee” chocolate ravioli may have stolen the show, a hard feat to pull off considering I was enamored with the first two dishes. It was without a doubt the best dessert of my life! Rich, creamy, and with a dash of acidic fruit for contrast: YUM! 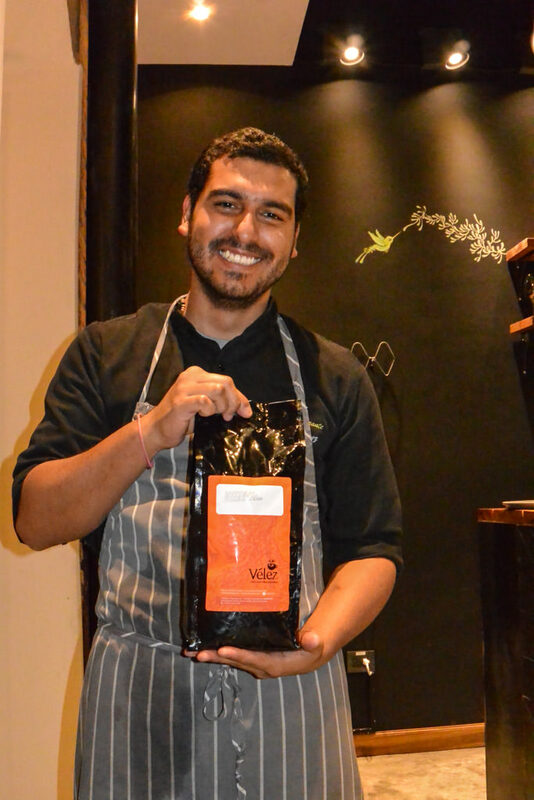 If you opt for the coffee, you may need to forever convert to Ecuadorian beans (being held up by Carlota’s chef in the photo above). The local, all-organic blend is honestly the best (and strongest) coffee I’ve ever tried in my life, and I’ve sampled Costa Rican, Brazilian, Panamanian and more, all locally to their source. Ecuadorian takes the cake. To book Hotel Carlota at the best rate, visit their website here! For getting to or from Hotel Carlota (if you’re not taking advantage of their transfer options), I’d recommend using the Grayline Airport transfer, bookable via Viator. 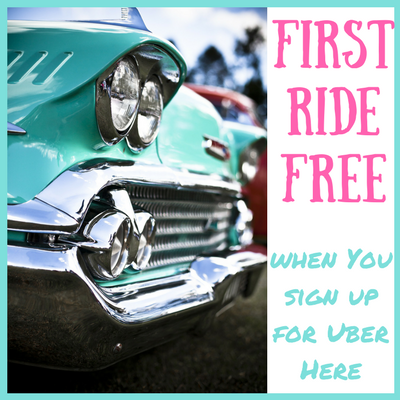 At under $10USD, it is MUCH cheaper than a typical cab, and much faster and easier than public transport (and maybe cheaper as well). If you’re looking for tours, I can highly recommend the Hop On Hop Off Bus. The bus picks up just a block away and is a great way to see a lot of the city (and learn even more) in a very short time. Commentary is provided in English and in Spanish. Do you have a favorite sustainable hotel? Totally well worth it! Incredible hotel, yummy food, and comfy robe+slippers… pretty unbeatable!